As you can tell, my family gets a little restless when the weather is nice. We love to be on the go and checking out the world around us. One of our travels took us to Blackberry Farm in Aurora. Blackberry Farm is a living history museum but offers so much more! On a pleasant day, we could easily spend a few hours there. The first thing you will notice when entering the park is that it is spacious and scenic. There are many buildings spaced throughout the park where children (and their adult personal assistants) can learn about history from pioneer days through the Victorian era. I think that the spacious nature of the park really lends itself to not overwhelming the children. So, I found my daughter much more engaged with learning about history than I expected---even when she was only four. and writing on a slate. She also was very engaged with the blacksmith demonstration. One of the buildings at the park houses the Early Streets Museum. This museum is one of our favorites. It gives you a snapshot of what a downtown area would look during the Victorian Era a music shop, pharmacy, toy store, and a general store. The display really brought history to life and it was neat to see my daughter asking about what she saw in each scene. The park has also interwoven some activities that scream "children love this place!" There is a train that circles a pond and takes you to a cabin. 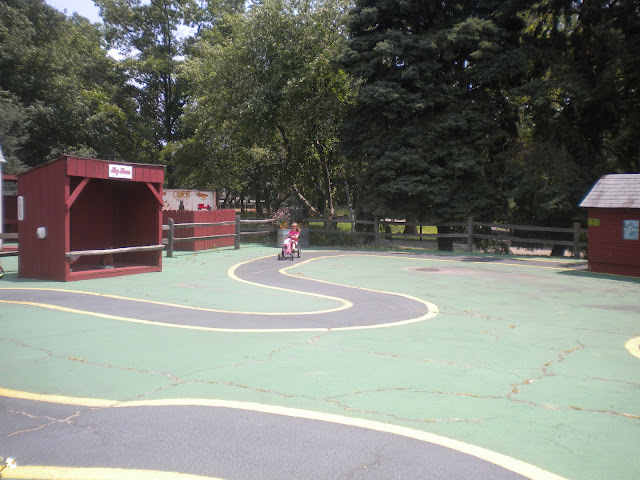 There is also a petting zoo and an area to ride pedal tractors. Additionally, there are pony rides and a carousel. All of these activities are added in the price---a la carte pricing can be a little annoying! There is food available at the park. However, we usually prefer to pack a picnic lunch. There are plenty of great spots for a picnic! The buildings do have some slightly different hours than the park itself so check out the website for info. Blackberry Farm is located at 100 S. Barnes Rd. in Aurora. Found you via mom's monday mingle. This looks like a great place to stop on our road trip to Michigan. Thanks!! It is fun--and educational and scenic at the same time! A perfect combination!